A professional chauffeur is considered by most clients to be a functional necessity. A Plus Coach agrees and goes above and beyond to not only make our Plymouth Black Car services luxurious but affordable as well. Our Plymouth black cars are designed to provide our clients with an environment to collect their thoughts, make calls and host clients of their own. Our corporate black cars Plymouth come equipped with beverages and all of the creature comforts you could dream of. Our Plymouth Black Car Service is the ideal way to travel while coming to and from the airport, traveling between cities, or safely attending business meetings. We do the driving, while you relax and focus on the finer things. Unwind, refocus and leave the ground travel up to A Plus. Seating up to 4 passengers, their luggage and personal items, A Plus Coach’s Plymouth Black Car is perfect for those that consider time and comfort important. Our professional and highly trained staff of chauffeurs are always ahead of schedule and ready to greet you at your pick-up point with poise and stellar service. A Plus Coach’s Town Black Service in Plymouth, MA is one of the smoothest rides ever. Don’t allow its sleek design fool you, the Lincoln Town Car is a heavy piece of machinery. You are sure to be safe while on the road in this fine automobile. The extended cab affords passengers added leg-room as well. Start your adventure with A Plus coach today! Here are some other fleet options for larger parties. Plymouth Black Car Sedan – A Plus Coach’s affordable Plymouth Corporate Town Car is a true classic and is one of our most popular selections. This exceptional automobile is custom built by Lincoln and extended 6 inches, affording you an enormous amount of legroom. Outfitted in premium black leather and rear climate and stereo volume control consoles in the armrests, this is a great way to affordably get around Massachusetts and all her fine cities. The Lincoln Town Car is ideal for those that are seeking comfortable and affordable Plymouth Corporate Limo Services. 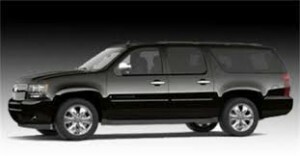 Chevy Suburban SUV – At the center of our fleet is the multi-functional and roomy Chevy SUV Suburban. Large enough to accommodate up to 8 passengers, this ultra luxurious SUV is fantastic for nights out on the town, Plymouth bachelor parties, weddings, group business excursions, as well as simply going from the airport to your hotel and back. Mercedes Benz Sprinter Party Bus – This is one of A Plus Coach’s most unique vehicles. It definitely is the ‘leave your cares behind’ option in ground travel. While deciding on what Plymouth Transportation Service in Massachusetts you’d like to go with, you should keep in mind the size of your party. Our Mercedes Benz Sprinter is perfect for large parties and can comfortably accommodate 14 passengers, their luggage and then some. Here is the good part… This vehicle comes equipped with ground effect lighting, plush red and black leather interior, lighted dance floor, server station to entertain your guests, and two extra large TV’s with DVD player. This brand of luxury travel is for those that dream big and know how to enjoy themselves. Start your adventure with us at A Plus Coach today. Your dreams are a CLICK away. Lincoln Town Car Sedan – A Plus Coach’s affordable Plymouth Black Car is a true classic and is one of our most popular selections. This exceptional automobile is custom built by Lincoln and extended 6 inches, affording you an enormous amount of legroom. Outfitted in premium black leather and rear climate and stereo volume control consoles in the armrests, this is a great way to affordably get around Massachusetts and all her fine cities. The Lincoln Town Car is ideal for those that are seeking comfortable and affordable Plymouth Transportation Services. Our Plymouth Black Car service is offered as part of our car service fleet in Massachusetts. This extraordinary sedan is the ultimate in luxury. Custom built by Lincoln and extended 6 inches which allows enormous legroom and comfort for the passenger. It includes over-sized rear doors, allowing our clients to enter the vehicle with ease. Our Plymouth Black Car service is also equipped with backseat control panels located on the rear arm-rest to adjust the climate inside the vehicle, while also being able to control the radio/mp3 volume at the touch of a button. Bachelor Parties and Bachelorette Parties – This is a night to cut-loose, if there ever was one. A Plus Coach offers the very best Plymouth Bachelor Party & Wedding Transportation services to all those seeking a safe and spacious way to bar-hop with all of your friends. Why hassle with costly taxis and unreliable forms of transportation? There is no need. For a reasonable price we will pick up your whole gang and show you a night to remember. Wedding Parties and Weddings – Now that you’ve calmed your jitters with a night out on the town with all of your closest guy and gal pals, it’s time for the main event. We have the best Wedding Transportation Services in Plymouth Massachusetts. Treat yourself and your guests to professional luxury car service for the big day. You will thank us later. We have antique wedding cars for the marrying couple, plus we have every vehicle imaginable to ensure your wedding party is well taken care of too. Begin the next chapter of your life the right way – in style. Click here to read more about our Antique Wedding Cars.